Vaseline just launched their latest Intensive Care Advanced Strength Lotion. This is Vaseline's newest variant to their Intensive Care Moisturiser range, featuring their Advanced Strength Lotion. The Advanced Strength Lotion is my perfect saviour as it helps to deeply moisturise and hydrate the skin for everyday. It's fragrance free and is made for those with sensitive skin which is perfect for those who suffer from really dry skin. Look to moisturise the skin at least everyday if you do have extra dry, irritated or sensitive skin as this will help to curb dry and flaky skin. What sets this lotion apart from the rest is that it contains 2 X more moisturisers than other Vaseline lotions. You can really feel a big difference with using this lotion as it just feels more hydrating and moisturising, which is perfect for all year round. Available at Priceline, Woolworths or Coles, RRP $5.99 (225ml), $8.99 (400ml) or $13.49 (750ml). 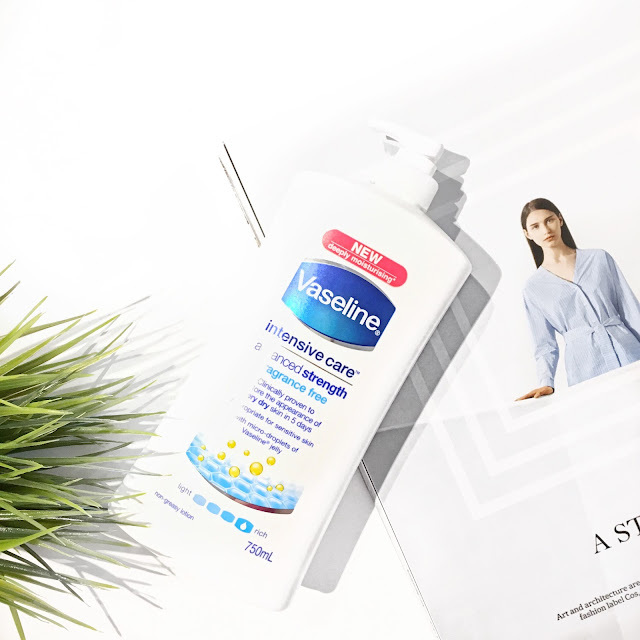 For more information, head over to Vaseline's official website here. What's your favourite Vaseline product?